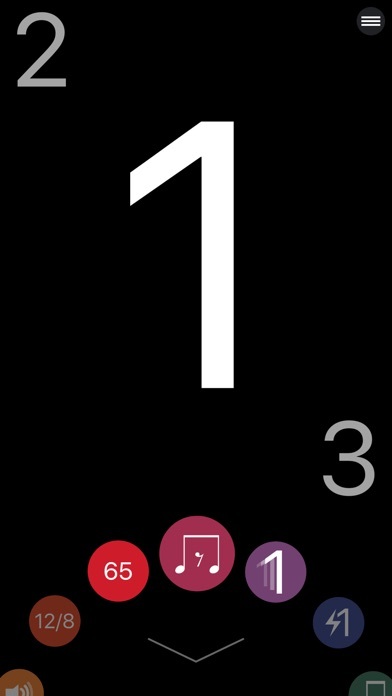 Beautiful, powerful, setlist metronome with multiple visual modes and a standalone Apple Watch app. Animated beat numbers, fullscreen flash, traditional pendulum, standalone Apple Watch app with haptic or audio and an iPhone remote control Click gives you what you need for practice and performance, and then gets out of your way so you can focus on what's most important, making great music! Turn on the NUMBER DISPLAY to help you count out a complicated phrasing or that odd time signature. Use the FULLSCREEN FLASH for watching out of the corner of your eye on your music stand. Or use the PENDULUM mode for a more classic feel. Wide tempo range, beat subdivisions, a variety of time signatures, multiple sound types, and a fullscreen mode for total focus make Click a powerful but easy to use solution for practice and performance. And, use the new setlists feature to save it all and recall your presets instantly! â€¢ Save presets for your next gig and stay on tempo and stress-free all night! â€¢ Dial in your favorite practice routines. â€¢ Fullscreen mode gives you the same large, easy-to-see visualization that Click is known for and combines it with the ability to switch quickly between preset songs. â€¢ Standalone metronome, with audio or haptic, for a quick tempo reference, even when your iPhone isn't nearby. Audio can also play indefinitely in the background on supported devices/iOS versions. Includes Tap Tempo feature, so can also use it to quickly find the tempo of any song. If you like Click and find it a useful tool, please consider leaving a review or rating on the App Store. It means a lot to me and helps others find the app as well! Feel free to contact me with questions or comments. I'd love to hear from you!